Following up on the rüts compilation and DVD manifesto, comes our new release, a collaborative effort of Massimiliano Pagliara (Balihu, Rushhour, Live at Robert Johnson) and Roger 23 (Playhouse, Baud, Swayzak Soundsystem, 240 Volt). Two exceptional tracks, aimed directly at a demanding and sweaty dancefloor. On the A-side, Berlin based band 'Sic!' (with Jules Etienne, Alessandro Tartari from gui.tar and Massimiliano Pagliara) have their track 'H-EA-L' remixed by Roger 23. A 10 minutes, moody Dub, this track pounds its way gracefully to the center of the dancefloor. Literally out of a thunderstorm, Alessandro Tartari's breathy voice emerges, sprurring on the track. Roaring subbass and an ever increasing amount of little chords, rhythmic elements and effects give the track a profound and dislocating spatial deepness. Right in its middle, the track reconsiders and breaks open into a warm, string-laden soundscape, restarts again but sounds as if reinvented. This is an epic piece of music fusing a relentless robotic structure with a warm sound production. The track on the B-side sees Massimiliano Pagliara and Roger 23 offering an even more dislocating piece of dance music. Filled with contrast and contradiction, this is a Disco House track for lovers of Dub and Techno music, a slow motion House track for DJ's not afraid to slow things down and take the dancefloor to the next level, a functional track for everyone willing to take it on and twist it around. The dub chords, which sound as if coming out of some gigantic echo chamber, the pounding bass and the piercing and catchy synth line are all mixed completely to the foreground. A track without physical heart that is all about heart. A beautiful contradiction. Something special. Die “H-EA-L” EP ist das Ergebnis der Zusammenarbeit von Balihu-Zögling Massimiliano Pagliara und Swayzak-Soundsystem-Mann Roger 23. Und was für eins! “H-EA-L” bringt all den Schmerz, die Wehmut und jene Sehnsucht mit, die männliche Stimmen auf Housetracks schon immer so begehrlicher erscheinen liessen als die weibliche Konkurrenz. Schlichtweg ergreifend. Wem das zu viel ist (der hat kein Herz), der findet auf der Kehrseite die verspätete Allianz von Disco und Dubtechno. Auffallende und angenehm ausfallende Hit-Platte. 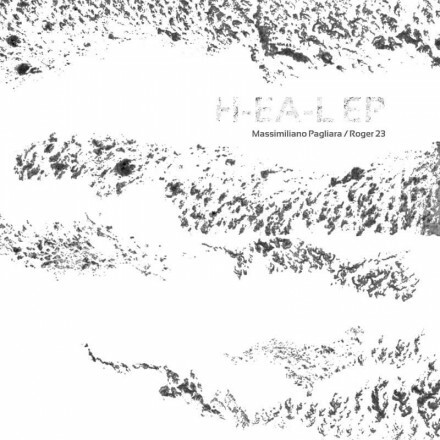 Roger 23 follows up that awesome Baud release from a couple of months back with two reworks of Balihu disco bloke Massimiliano Pagliara’s “H-ea-l” cut. It’s really all about that title track, a lengthy dancefloor tripper shaped with R23’s attention detail, meaning sumptuous bass and glorious dub-spacious atmospheres with a glowing pulse of loved-up Chicago house chords leading to tactile breakdown sure to melt big floors like Panorama bar and the like. It’s a standout cut. On the flipside, Roger remixes “I Hear You Say” into a deep and tracky groover, but it’s not a patch on that A. Big track for fans of emotive Berlin House music! Roger 23, AKA Roger Reuter, tends to work quite slowly on releases that bear his own name, so it’s a relative surprise to see two pieces of vinyl come down the pike in quick succession. Luckily, it’s clear that both are of the usual Reuter-quality. The first, reviewed in these pages, was a deliciously dark record. The second, the one you’re reading about now, sees Roger in a similar mood, taking the knife to Massimiliano Pagliara and then working in conjunction with him on the B-side. The A-side, where Reuter is allowed to work unfettered, is the star of the show: It begins with a thunderstorm, and gets even more epic from there: It’s a propulsive dub techno stomper whose grinding gears are exposed throughout. Unlike much up-tempo dub techno, though, Reuters peppers it with pop elements. A shimmering melody flutters in and out of the stereo field like a ghost, a voice wandering around the word “heal.” Reuter is never content to let a groove go without making sure that something else is tugging lightly at your heart strings-or is about to. “I Hear You Say (23 Seconds Too Late)” is more straightforward dance floor fodder. Dub techno at a beatdown pace, it does little to distinguish itself. A very nice production, and perhaps ideal for a warm-up set, but one wonders what might’ve happened if Reuter had worked alone on a remix as he did on the A-side. Na hun succesvolle rüts-serie in 2008,is meakusma hier nu met de eerste “echte” release op hun label, deze van de hand van Massimiliano Pagliara en Roger 23. Wie de meakusma-feesten kent, weet ook wat van deze release te verwachten: kwaliteitsvolle muziek die je moeilijk onder één noemer kan catalogeren. Ok, ik heb het in deze bespreking de stijl ‘house’ meegegeven, maar het is eigenlijk veel meer dan dat. De dub- en disco-invloeden zijn niet veraf, maar het is vooral dirty. Heel dirty. Dit is een ep voor de veeleisende zwetende dansvloer. De A-kant “Heal”, in de versie van Roger 23, richt zich meer naar het midden van de dansvloer, terwijl B-kant “I Hear You Say” enorm vertraagt om een totaal andere dimensie te creéren. Après leurs succès avec “rüts” en 2008, meakusma présente ici la première vraie sortie sur leur label par Massimiliano Pagliara et Roger 23. Ceux d’entre-vous qui ont eu le bonheur d’assister aux soirées meakusma, savent quoi ils peuvent s’attendre: de la musique de qualité sur laquelle il est difficile de coller une étiquette. En effet, bien que je l’ai qualifié de House, ce track est bien plus que ça. Les influences dub et disco ne sont jamais loin, mais c’est surtout trash, très trash. Voici un EP pour vous faire suer sur le dancefloor. La face A “Heal”, dans la version de Roger 23, étant réservée aux heures de pointe, tandis que le nettement plus lent “I Hear You Say” sur la face B crée une toute autre dimension.